You've probably heard the joke about the quality of cellphones- "As a telephone, they make great television sets". And it's true, especially in the early days of mobile communications, that if you needed to talk to someone, those cute little phones were maybe not the way to go. After all, reception was often poor. It sounded as though the speakers were communicating from inside of a well. And they weren't communicating at all if one of them was driving under a bridge, near trees, etc. Fortunately, the quality and reliability of cell phones has improved dramatically in the last five years with the introduction of the "smartphone". What's more, the advent of application technology has made them even more useful, for entertainment, for education, and for work. In fact, as prices of these phones and related mobile devices decreases and their quality increases, more and more businesses are purchasing them for employees to use as part of their jobs. While the construction industry has been slower than others to hop on the device bandwagon, now that there is device friendly software like Raken's app for contruction daily reporting and others for payroll logging and building modeling, more and more project managers are shopping for construction management apps. But not all devices are the same. Some are better suited for playing games than as a site tool. So what are things that should be considered before a project manager goes device shopping for his or her firm? 5. Who Will Be Using These Devices And How Often?If everyone on site, from supervisors to workers will be using these devices, especially for communicating, smartphones are the best choice. They come in a handy pocket size, too. 4. Where Will These Devices Be Used?Those tablets look very cool, and their screens are easier to view than a smartphone's. But they're also more awkward to lug around a construction site. Don't be swayed by the "glamour" of a device, pick the right one for a particular job. 3. ConnectivityIt sure sounds like a robust WiFi signal is the law of the land, doesn't it? But it's not. To be sure your devices have solid connections, invest a few extra dollars and buy ones with built in 3 or 4G as opposed to ones that only pick up random WiFi signals. 2. UpgradesSmartphones and tablets can be great tools, but they're not as cheap as say, a screwdriver. Device company reps will certainly warn you that you need to upgrade frequently, but hey, they're tying to sell new devices. iphones operate on the iOS system, which passes along software updates on all of their phones as they become available. 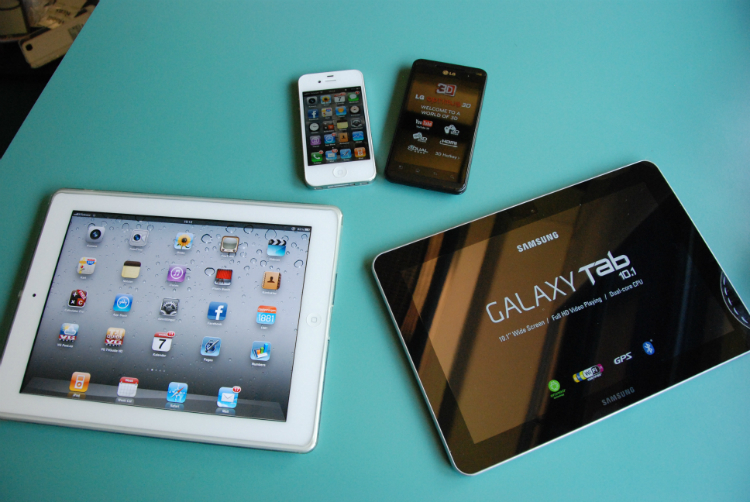 If the right type of device is chosen, swapping for upgrades may not have to be a frequent proposition, saving money. Select The Right AccessoriesThose Hello Kitty vinyl skins look awesome, true, but they won't protect that expensive smartphone from a fall or construction dust. So make sure those devices come with appropriate protective cases and belt clips. If workers must talk and drive on site, make sure they have the appropriate hands free gear, as well.